15minutes is a productivity app inspired by pomodoro technique. One way to fight procrastination is to just start working on something for a fixed, short amount of time. It's known as time boxing or pomodoro technique. Time boxing requires a timer and 15minutes is just that: a timer. You start the timer and when it's done, it gets your attention. You can, of course, use any timer. A kitchen timer will do. An iPhone will do. I wrote 15minutes because I mostly care about not procrastinating on my software developement tasks. When I program, I'm at the computer, so software solution works well. I used to use iPhone's timer (part of built-in clock application) but it had a fatal flaw of using sound to alert and no way to shut it up. I don't't think that my coworkers liked to hear my iPhone buzzing every 15 minutes. Also, timer on iPhone has no way to pause/resume. 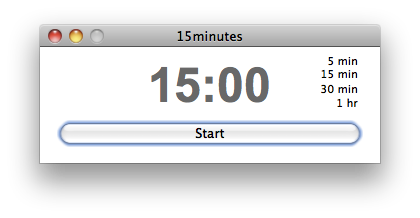 15minutes is an open-source application written in C# (Windows version) and Cocoa (Mac version). Source is available at github.com. Fork away. The program icon comes from hand-drawn icon set by Alexandra Wolska (available under Creative Commons Attribution-Share Alike 3.0 Unported license).